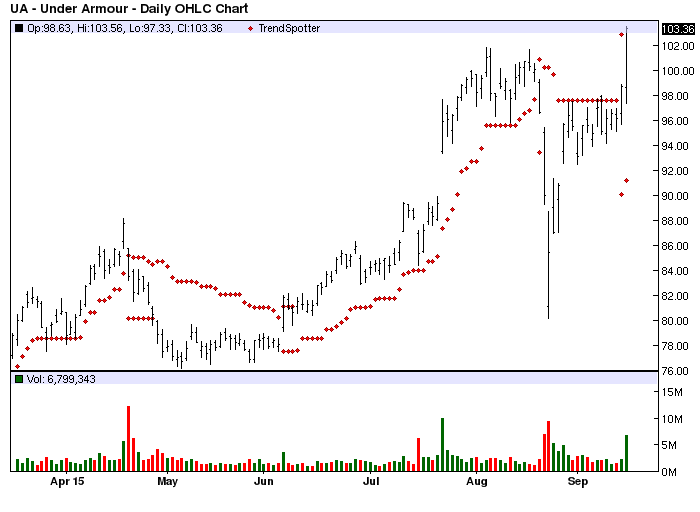 The Chart of the Day belongs to Under Armour (UA). I found the sports clothing stock by using Barchart to sort the Russell 3000 Index stocksfirst for stocks with technical buy signals of 80% or better then for a Weighted Alpha of at least 50.00+. Next I used the Flipchart feature to review the charts. The Trend Spotter signaled another buy on 9/15. Under Armour is a leading developer, marketer and distributor of branded performance products for men, women and youth. The brand's moisture-wicking synthetic fabrications are engineered in many different designs and styles for wear in nearly every climate to provide a performance alternative to traditional natural fiber products. The Company is an official supplier to the National Hockey League, the U.S. Ski Team, USA Rugby, the National Lacrosse League, and Major League Lacrosse; and the Company's products are worn by professional football, baseball, and soccer players, as well as athletes in major collegiate and Olympic sports. The Company's products are currently sold in the United States, Canada, Japan and the United Kingdom.